One of the coolest things about Windows Workflow Foundation is the workflow designer. It’s visual programming. You drag and drop your components onto the design surface and configure the properties of each module to create a functional application. Microsoft makes it easy to re-host the workflow designer in your own applications, providing you with an easy way to include customization and configuration tools for your workflows. 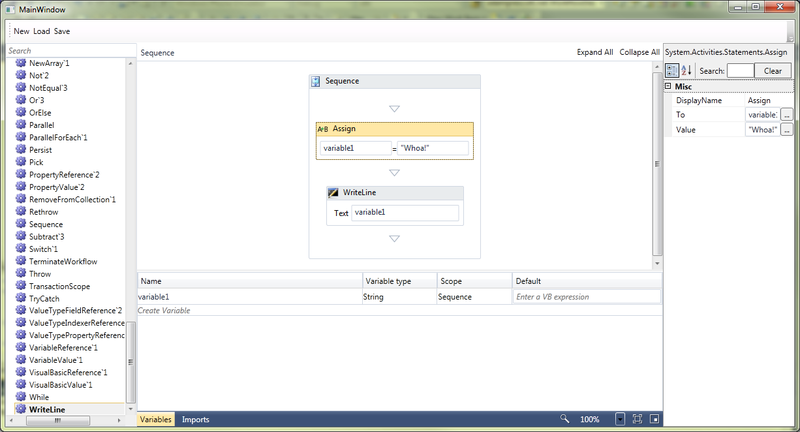 I found a great bare-bones tutorial at MSDN: Rehosting the Workflow Designer. There’s some important functionality missing from this tutorial, though. There are no mechanisms for opening or saving workflow files, and the toolbox is only populated with two controls. So, I’ve taken the MSDN tutorial, compressed the steps, and added some additional key functionality. That’s it! Once you’re this far, you should be able to run the program. If you’re looking for a more in-depth, step-by-step explanation of the code, follow the link above to the MSDN tutorial. The only differences below are that I added some reflection code to extract the “standard” workflow activities, and I added Open and Save buttons. This work in 2010, however, I can’t drag and drop the items on the canvas. Seems that drag and drop functinality is missing.